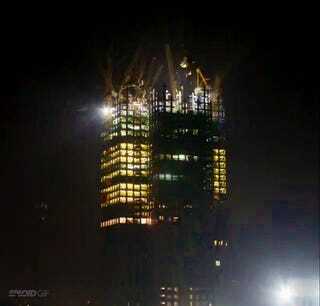 Sploid reader Xian Min Zhang sent us the latest time-lapse video of the construction of his latest building: A 57-floor 2-million-square-foot (180,000-square-meter) skyscraper fully built with energy-efficient, factory-produced Lego-like blocks. He claims that they are now building these at a record three floors per day! The company keeps increasing their building speed and size of these buildings at an impressive rate. It is still not the 220-story skyscraper they claimed they were going to build, but it is amazing nonetheless. This building has 19 10-meter-high atriums, 800 apartments, and office space for 4,000 people. Zhang claims that the use of modules reduced the use of concrete by 15,000 trucks, which he says almost eliminated all the release of dust in the air, an important advantage in pollution-ridden China. Talking about pollution: He claims that all of the air inside is 99.9% pure thanks to the tight construction and built-in air conditioning system. The building has quadruple-pane glass and, he says, is so energy efficient it will save 12,000 tons of CO2 emission compared to a building of the same size and use.